a nightmare, they sold out in minutes. I'll never understand how that is possible. What is the secret to getting through before someone else? It's just crazy. they ever tour again I needed to go. They're my favorite band. of finding tickets but somehow, I got extremely lucky. Our seats were perfect. venue to see a show, I really don't think there's a bad seat in the house. concession areas. It was a nice touch that they have local vendors. but I wasn't expecting them to sound better live than they do on the records. 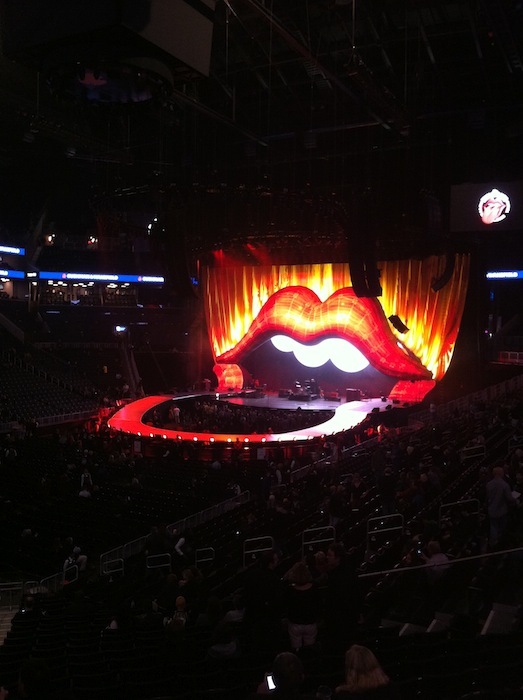 Mick Jagger must have run at least three and a half miles during their performance. You Can't Always Get What You Want and Jumping Jack Flash. Oh and Mary J. Blige even came out to sing Gimme Shelter! and not have enough time to play all of their best songs. predicting the entire set list and leaving it out from the start. I cannot say how happy I am that we were able to see them. The show as seen through my iPhone, & JD's too..
Mary J. Blige and Mick Jagger having a dance off during Gimme Shelter. Wow, this looks like an amazing concert. Sounds like you had a great experience! I just love that euphoric feeling you get after you attend something like that.